Everything has certainly been said about the biggest weekly market in Germany. With its variety in the field of classic market goods as well as in specialities, it is a magnet for regular customers and tourists alike. Not only the length of 750 meters makes this market location unique, even the metro viaduct offers the customer a protective roof, under which it is possible to shop. 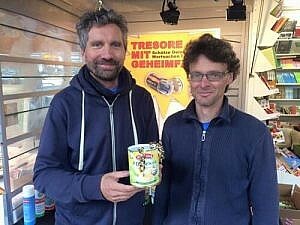 VANRODE has been represented with his label plasticfantastic at the so called Buchretter on the Isemarkt since May 2015. Between the Hamburg suburbs of Eppendorf and Hoheluft over one kilometre and 12000QM area every Tuesday and Friday from 8.30-14.30 Hamburg’s most beautiful weekly market takes place. More than 200 dealers offer fresh and individual goods – and this since 1949.